Travel in time to the 19th century and have a great adventure! A great puzzle game of sliding pieces in another Bejeweled like game. Many levels. Travel back in time to the late 19th century and get ready for spectacular adventures on land, sea and air. Use the unique chance to visit four continents with this outstanding puzzler based on the classic novel of the same name by Jules Verne. This game is online. Around The World In 80 Days Want a trip around the world to participate in eighty days without tickets! You are Philcas Fogg, an adventurous traveler who takes up the challenge to complete the trip of eighty days. Wish to get into his shoes? Try this. Get 3 identical symbols in a row by swapping 2 arbitrary symbols. 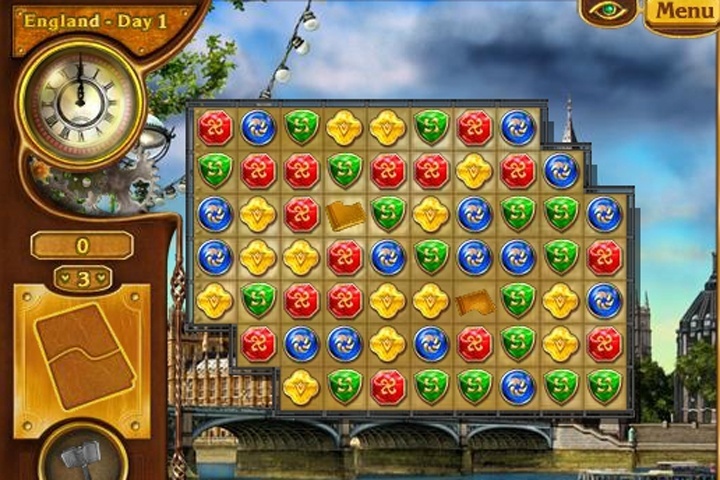 Attach two pieces of Mr. Fogg's diary by removing all tiles. 4 Match tiles to recharge and power ups. Upgrade your hammer through the charging device 100%. Delete a particular type of tile with a hammer charged. Got Spirit? Get going! Drive the puzzle pieces to the bottom of the game field by getting rid of tiles under it and you will see it added to the item outline on the left. Complete the item as you travel around the world in the fastest time as you can. Use your mouse to solve the fun match-3 puzzles. If you want to play Around The World In 80 Days games online you have come to the right place! GamesLoon adds new Around The World In 80 Days games every week. This is your game portal where you can find the biggest collection of free Around The World In 80 Days games online. Do not forget to rate our Around The World In 80 Days free online games while playing!